What's the deal with Ben Affleck? He started cool with his roles in Chasing Amy and Good Will Hunting. Then he got really lame with Armageddon and Pearl Harbor. Now he has reemerged as a cool, first with Gone, Baby, Gone (which I thought was OK) and now with The Town. His most underrated role in the past few years was in Hollywood Land. It looks like he tried to be the lead actor thing and made his money. With cash in hand, now he can pick good projects. 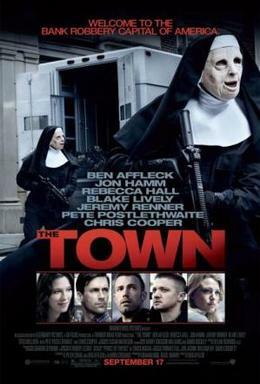 The Town is a really cool heist movie, (though it's never really explained why Hawkeye and Daredevil want to rob banks), but it has a lot more than that. At its core is an intersting relationship between Affleck's character, a bank robber, and his hostage. It isn't some kind of Stockholm Syndrome type of relationship. She doesn't know he was one of the bad guys. The ultimate conclusion to the movie (ambiguous here to avoid spoilers) is a bit suspect. Would she really make the choice she does in the end? To me, I find it to be a bit of a stretch, which possibly dropped this movie down a notch or two on the list. But there's enough great stuff to strongly recommend this, and I look forward to watching it again. Another great element of the movie is the neighborhood. It takes place in the Charleston neighborhood of Boston around Bunker Hill. There are some great aerial shots of the Bunker Hill Monument - better than any images I've been able to find online. After the movie, I searched for a few overhead shots of the monument to place into my Powerpoint for discussing the Revolutionary War. I couldn't find anything nearly as good, though I didn't spend too long looking. So I know that I'll watch this again at least once before next September so that I can take some screen grabs.